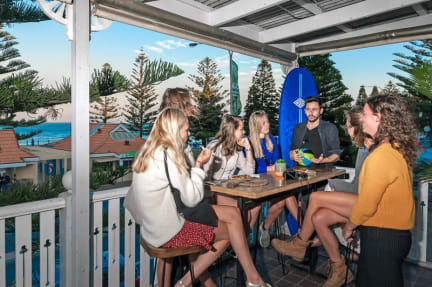 Kick back like a local in the hip neighborhood of Coogee to escape the bustle of downtown and have a true Aussie experience. Mad Monkey has recently taken over this beachfront hostel. Our friendly staff is happy to help with anything you need to make sure you have the best stay possible. The hostel is sparkly clean and super friendly, and you can expect to find our normal Mad Monkey social and party atmosphere that we are famous for. Our unique accommodations offer everything from traditional dorms to apartment-style lodging with en-suite living rooms and kitchenettes. We offer a clean, comfortable, and affordable place for you to call home in Sydney, in newly refurbished rooms and dorms. We've also just opened a full service restaurant and bar, FNKY MNKY! FNKY MNKY is Coogee's newest co-working space, offering free WIFI to guests along with a great place to work and delicious food and drinks. We also partner with TwoSpace, a network of co-working spaces across Sydney. We are also proud to announce we have a travel desk located in the hostel ! Backpackers World are a team of international travel experts and are here to make sure you enjoy your trip of a lifetime through Australia, New Zealand, Fiji and South East Asia. With stores Australia-wide and a growing global network our well-travelled, experienced and passionate staff are there every step of the way - we speak your language, be part of our world. All of the city's other famous attractions are also just a short ride away, there are regular bus services that run both day and night into downtown Sydney that stop just outside of the hostel, regular train services leave from Bondi Junction that connects you to the wider Sydney area and greater New South Wales. Bondi Beach, Gordon's Bay, Clovelly Beach, Bronte Beach, Tamarama Beach & Maroubra beaches are all a short walk away, so if you are looking for a hostel near the best beaches in Sydney we are a great choice. 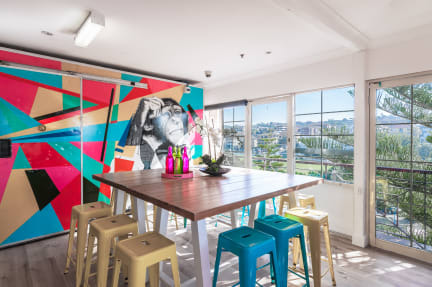 The Hostel is just a few minutes away from Randwick Campus of the University of New South Wales, making it a great place to stay when visiting people studying at UNSW Randwick. The Coogee Beach Cricket Oval is located next to the hostel, located close by are also the Latham Park Tennis Centre, The Australian Golf Club, The Lakes Golf Club, The David Philipps Sports Complex, Coogee Surf Club and Bondi Surf Club are all within easy striking distance. If you are into nature Moore Park and Centennial Park are close by as are Trenerry Reserve, Grant Reserve, Arthur Bryne Reserve & Malabar Headland National Park.